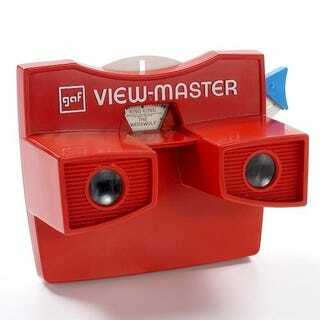 No matter your age, there's a good chance that a View-Master was lying around either your bedroom or a friend's. The iconic red goggles are the perfect childhood diversion—cheap and briefly amusing. They also have a long history. The principle that makes the View-Master a bit of quasi-3D fun is a fundamental one behind all our vision. Stereoscopic viewers—simple devices that essentially make you go cross-eyed to perceive photographic depth—have been exploiting this principle since the 19th century. All it takes is a basic optical effect the brain teaches itself early on: when two images from slightly different angles are viewed by our eyes, we combine them into a unified perception. The Victorians, with their pipes and smokestacks and monocles, used to laze about and amuse themselves with the first stereoscopic toys! Oh my! A vivid image of a savage tribesman! Fast forward a century, and the idea gets an interesting makeover. In the 1930s, amateur photographer William Gruber teamed up with Sawyer's Photo Services, a small firm that produced souvenir postcards. But postcards were boring, even in the 1930s. What wasn't boring was Gruber's ingenius, custom-made stereoscopic photo setup, which combined two Kodak Bantam Special cameras onto a single tripod. Calibrated correctly, the dual-cam system produced a pair of images that could be turned into a rudimentary 3D scene through stereopsis. Realizing that he had a hit on his hands, Gruber put together a prototype that would allow people to take their favorite scenes with them. He debuted his creation at the 1940 World's Fair in New York—a year later, he had sold 100,000. The device's simplicity and quick fun caught on even quicker—soldiers used it to train during WWII, families toured national parks from their homes, and after landing the humungous Disney license, lots of kids stared at 3D stills of Mickey. Fisher-Price now owns the tech, and knows not to try to fix what ain't broke—the View-Master's basic design hasn't changed in the 80 years since its invention. Pop a film reel from 1940 into your View-Master from 2010, and it'll work like it did at the World's Fair. And an entire community of stereoscopic fanatics—somehow including Queen guitarist Brian May—is devoted to the optical illusion, even creating their own custom View-Master reels (if I only I had known I could have seen my goofy prom pictures in 3D!). Since 1939, over 1.5 billion View-Masters have been sold. So next time you see yours lying around your childhood bedroom or basement, pick it up and think of Gruber. Oh look, a giraffe! Click.